Gate lice, those passengers who stand up in the boarding area up to an hour before boarding, have always made me chuckle. Yes, bin space is precious–but I don’t think that is why some people line up early on United’s red carpet. Instead, I think (no, actually I know) certain passengers just like to show off. It’s one thing to line up a little early. It’s quite another to have your gold boarding pass with First Class seat assignment visibly sticking out of your navy blue blazer, engage in a loud conversation on your bluetooth headset, and even break out the laptop for good measure, because, by golly, WIFI reception is just a little better on the red carpet. Can’t these pitiful people tell no one is impressed? Or are you impressed when you see men and women (but almost always men) of "stature" perched like a vulture on the red carpet waiting to swoop down upon the airplane and collect their pre-departure beverage? Or do you even agree they are trying to impress others? Previous Article Boycott a City Because of Rude Airport Workers? @Mike: Southwest has actually improved. I still don’t like their cattle call system, but at least with the numbering now there is no need to line up early. 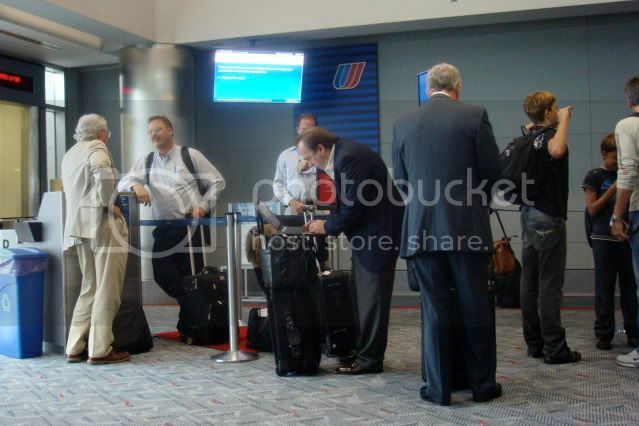 On some United flights, you will see leisure flyers line up early–like at Frankfurt for example where they rarely properly control boarding–but it seems that most of the gate lice crowd is always the DYKWIA elites. I wonder if you would make so much fun of WN boarding if you could earn your group number by flying, ie highest spending southwest flyer gets A1, second highest gets A2, etc. Except it would have to be miles, not $ or the game breaks. @kd5mdk: Southwest is Southwest. They have their own way of doing things and it seems to work well for them. In answer to your question, I would definitely be making fun of Southwest flyers if Mr. 1A was proudly perched under his spot 40 minutes before boarding! I had to fly Air Tran for the first time in like 5 years this past weekend. You have assigned seats and board in zones, but the number of people in zone 6 and 7 trying to board in zone 1 was ridiculous. In Milwaukee, the gate agent threatened to gate check anyone’s luggage that tried to board out of order. The gate lice quickly moved away from the gate. One of my favorite things to do is to line up on the red carpet unshaven and wearing ratty clothes with my F BP tucked in my pocket. So much fun when people tell me I’m in the wrong place.